SEEING – What (good) examples of digital technology in theatre do you know? DOING – What are you already doing in your organization or community (related to digital technology and theatre)? OPENING UP – How can digital technology (help) attract new audiences? DREAMING – What would you like to happen in the (near) future in relation to digital technology and theatre? Technology is a decisive factor in our contemporary society. Code = culture. Algorithms define our way of life. We all have seen digital technology’s potential to transform sectors in examples such as Uber an AirBnB. Good examples of the use of novel technology in performance context have also been around for quite some time now, and you as a collective are aware of those, such as the Wooster group, Rimini Protokoll and lots of others, listed in the overview below (‘Seeing’). 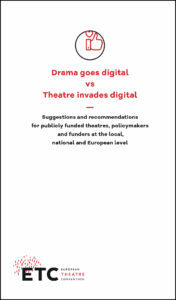 At the same time, it seems the theatre domain is still at the start of its potential transformation, still looking to get a grip on digital strategies and practices – as are other domains such as education and heritage to name a few. In principle you see digital technology to have impact on several aspects of the theatre business, e.g. 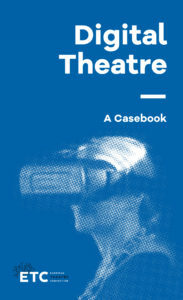 enhancing the use of social media is often listed by you, optimizing the outreach of theatres – but hopefully on its own terms and not simply as ‘another broadcasting medium’ – and there is a definite interest to see where technology can affect the core of the theatre, you dream of more active and engaging roles for (younger) audiences, and improvising with real time data (see your answers in ‘Dreaming’). But the dreams seem a bit modest or cautious (the need to find balance, the desire to resist). From our experience as a medialab that is continuously looking at the impact of new technologies, we sometimes just have to dive in there, start playing around with, say, neurotechnology or space technology. It is good to be critical, as new technology can be overwhelming, it is hard to know where to start, it requires implementation of new practices, it requires new skills, but sometimes the best strategy is just to start trying things out for yourself. And take it from there. Prototyping is a good entry point to a dialogue with other makers, (new) audiences and different stakeholders. Working in multidisciplinary teams that have different backgrounds can help to see how we can use technology in new ways, to design new (social, intimate, emotional, engaging, …) applications and practices. And continue your conversation: continuous and open sharing of results and experiences will help you move from a community of practice to a genuine learning community. Consider yourself to be the R&D department of society, where cultural and social values are made explicit. It is a response to the growing impact that companies have on our lives and will definitely challenge their current approaches. Looking forward to see where you will take us. 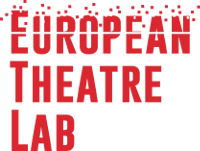 The project “European Theatre Lab: Drama Goes Digital” has been developed with the support of the Creative Europe programme of the European Union.